Take a break from slots UK and enjoy this colourful scratch card online game that features exciting twists, turns and cash rewards. Simply pick a gemstone to turn over and you could win some cash. Match a certain amount and colour of gemstones and you could win even more. Epic Gems at Wizard is a visually enhanced minesweeper for the 21st Century. Gamevy was founded in 2013 and even though they haven't been around as long as most of the market leaders they have already proven themselves to deliver high-quality and innovative games. Their products offer fun and engaging games where player choices or skills really matter. The development team is filled with creativity and revolutionary ideas. Gamevy offers completely different games to anything else in the real-money market, developing immersive gameplay experiences for their audience. There are more Gamevy games available at Wizard Slots. Epic Gems is gorgeous in every way. The background is a pretty space with asteroids moving around in both directions. In front of the screen, you are presented with 40 different gems varying in shape and colour. To the right, you will have the menu to set your bet and once you hit “Play” the buttons turn into a swirling vortex swallowing every gem you select. The intriguing sound effect is just as addictive as the lovely art providing an excellent gameplay experience. That said, we have listed the best new online slots based on players' preferences. The game is very simple and straightforward all you have to do is to place a bet between one and ten pounds. 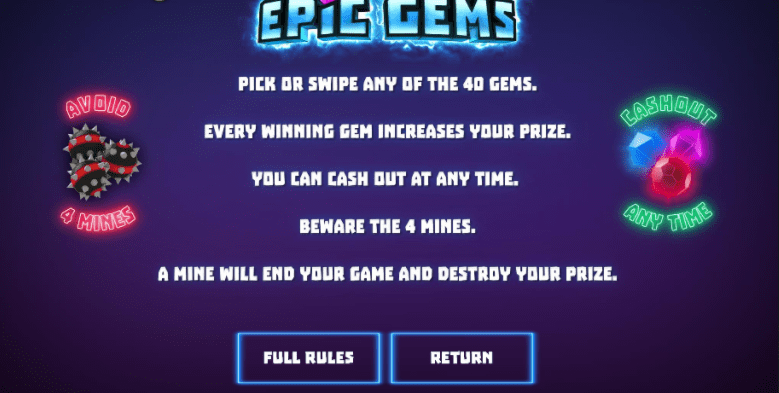 Then you can pick gems and for each gem, you pick your prize will increase. But be careful as there are 4 hidden mines under the gems. If you click a gem and it reveals a mine everything blows up and your game ends leaving you empty-handed. You can decide to cash out at any time so it is really up to you and how much risk-taking you like to earn bigger rewards. The gems come in different shapes and in all kind of colours. You will see beautiful glowing blue, red, green, yellow, purple and turquoise gems floating around in space. Whenever you choose one a little animation is played and they will disappear into the vortex. When you discover a mine all of the gems get a little explosion animation making the game even more immersive. The user interface is clear and simple and you are always told how much you will cash out or how much a further gem would grant you. The way the controls work are also very smooth. You can either pick a gem one by one or slide over whole rows to select all of them at once. This very intuitive and easy way to play this game adds a lot to the game feel and makes it very engaging. Epic Gems is beautiful and very soothing. The sound effects and aesthetics go very well together and enhance the gameplay experience massively. It feels nice to play and pick one gem after the other. This game is of very high quality with a consistent gameplay and art style. This game is relaxing yet exciting as you never know when you will hit a mine. 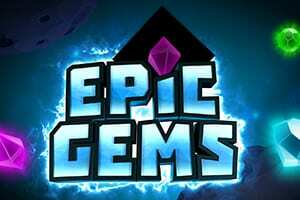 Epic gems are perfect if you are looking for some change from the classic casino games. Another epic game is lost island slot.